GoldenEar's founders and their engineering team have literally hundreds of years of combined experience and have created or helped to create many of the world's best-sounding and best-selling loudspeakers. We have joined together again to build our finest speakers ever. We call our newest loudspeaker company GoldenEar Technology because, in our industry, a "golden ear" is someone who hears exceptionally well. Because we do, the industry and audiophile press have consistently praised us over the years for our "golden ears" and all the many loudspeaker accomplishments that our unique talents have helped us to achieve. We lavish the same kind of care, expertise and experience that is usually reserved for the highest-priced high-end speakers on every GoldenEar speaker that we create. We do it because we can - and because we know that you will enjoy and appreciate the result. With GoldenEar loudspeakers you will not be aware of the sound coming from the specific locations of the speakers. Instead, the soundstage will spread seamlessly and fill in the spaces between all the speakers. It will extend beyond them in terms of depth and above them in terms of height. This almost magical quality of superb imaging is what allows you to close your eyes and imagine that you are in Carnegie Hall listening to the Philadelphia Orchestra, in Madison Square Garden listening to the Rolling Stones, in the Village Vanguard listening to John Coltrane alive again or rocketing through space in a starcruiser dodging meteors. It really does it for us and so we have always spent a tremendous percentage of our engineering and development time focused on achieving superior imaging. 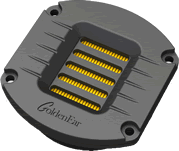 is GoldenEar Technology's premiere product embodying all of GoldenEar's cutting edge technology. The sleek 48" tall Triton Two is a high-performance loudspeaker with a built-in powered subwoofer. The Triton Two Tower is engineered for superb performance in both high quality two channel stereo systems as well as in multi-channel home theater and music systems. The sleek, elegantly curved and tapered design is not only gorgeous but is important from a performance perspective as well. There are two cast-basket upper bass/midrange drivers, which incorporate GoldenEar's proprietary Multi-Vaned Phase Plug (MVPP) as well as a computer optimized cone design. They are arranged in a D'Appolito array surrounding the tweeter, an extraordinary new High-Velocity Folded Ribbon design. This remarkable and unique ribbon tweeter propagates sound waves and moves the air by squeezing it with its accordion-like pleated diaphragm, rather than pushing it as conventional drivers do. 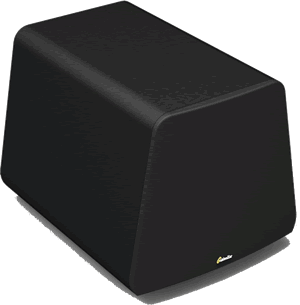 The subwoofer section is powered by a 1200 watt GoldenEar designed ForceField Digital Amplifier. The amplifier's DSP design not only yields extremely linear and low distortion response, but also dynamically controls operating parameters for optimum performance. With its sleek, narrow 5.25" wide baffle, the Triton Two's sophisticated look not only blends with any decor, but also helps the speaker create truly magnificent 3D imaging with tremendous depth, height and width that extends well beyond the loudspeakers themselves. look and sound great, producing detailed and rich sound, with surprisingly deep and full bass, and lightning quick treble response from the folded ribbon tweeter. The new Triton Seven brings Speaker-of-the-Year Award winning Triton Series performance into a more compact size and even more affordable price range. GoldenEar's Triton Towers have set new performance and value standards all around the world. The new Triton Seven follows in this auspicious tradition. 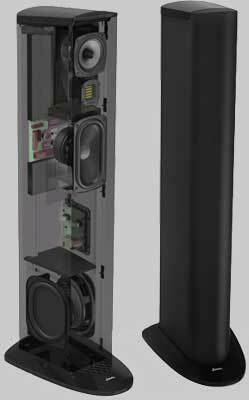 Although it is the first Triton Tower without a built-in powered subwoofer, it still achieves superbly deep, subwoofer-like impactful bass performance by combining advanced technology drivers with our highly evolved and sophisticated bass-loading technologies. The Seven's unique cabinet shape is both acoustically purposeful as well as strikingly attractive. Its stylish rearward rake, in conjunction with the complex crossover, both aligns the driver array precisely for a coherent wave-launch directed at ear level at the listening position, as well as results in non-parallel front and rear baffles for better control of internal standing waves. And, of course, the non-parallel side cabinet walls and slanted top provide the same acoustical performance benefit, as well as looking great. The Seven's precise and totally boxless imaging characteristics are further enhanced by the narrow front baffle, as well as the diffractionless designer grille cloth sock which adds additional sheer damping to the cabinet. In addition, the beautifully sculpted piano-gloss black base adds significantly to the Seven's dynamic stability. Like the signature Triton Two, the Seven combines a D'Appolito array of bass midrange drivers, which surround the same, now famous, High Velocity Folded Ribbon Driver, (HVFR) used in both the Triton Two and Three. The HVFR tweeter functions by pressurizing the air, rather than pushing and pulling it, for much better impedance matching with the air. This results in superb extension combined with a silky smooth non-fatiguing character, which is both unique and extraordinary. The spiderleg cast-basket 5.25" bass/midrange drivers, newly developed at our Arnprior, Canada engineering facility, have been specifically designed for exceptionally long-throw for tremendous dynamic range and extraordinarily deep bass response. The Triton Seven's high-resolution sonic performance makes it perfect for the highest quality two channel systems as well as the best multi-channel music and home theater systems. They are designed to perfectly complement and match the Triton Towers and Aon Bookshelf loudspeakers, both sonically and cosmetically. Their sophisticated industrial design is both attractive and functional, both minimizing their apparent size as well as enhancing their acoustic performance. Both new center channel models incorporate a D'Appolito Array of two newly developed long-throw 5-1/4" bass/midrange drivers surrounding one of our signature High Velocity Folded Ribbon (HVFR) tweeters. The 5-1/4" drivers incorporate spiderleg cast baskets for rigidity and minimal internal reflection, as well as our unique multi-vaned phase plugs (MVPP), to minimize cross-apex wave propagation interference. Both also utilize top-mounted pressure-coupled quadratic planar low frequency radiators that both extend the bass response as well as provide the bass/midrange drivers with ideal acoustic loading and damping. Only 1" of clearance is required above the bass radiators. 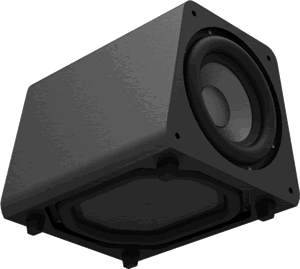 The larger SuperCenter XL benefits from dual 6-3/4" x 8" quadratic planar low frequency radiators, giving it significant low frequency extension and exceptional dynamic range. The SuperCenter XL is perfect for even the largest home theater systems. The smaller and amazingly compact SuperCenter X incorporates one 7" x 10" quadratic planar low frequency radiator for surprisingly full-range performance from a modest sized enclosure. 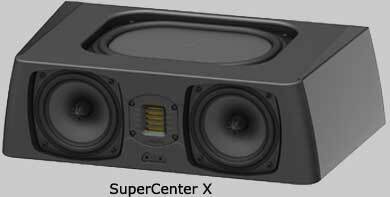 The Super Center X is just the perfect size and performance for the typical size living room or family room home theater system. Sonically, the new centers offer the same lifelike, highly detailed, high-resolution, smooth, open, boxless sound quality that our SuperSat centers are famous for, but with additional low frequency extension for greater dynamic range and impact. Its powerful and dynamic output capabilities make it the ideal center channel for a Triton based theater system. 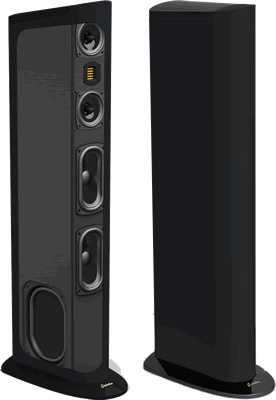 The SuperSat 50 is a slim, 27" long, 2.5"-deep speaker which is available in both a vertical version (SuperSat 50 - right, shown on optional Table/Shelf stand) as well as a horizontal, center-channel-optimized version, the SuperSat 50C. Its powerful and dynamic output capabilities make it the ideal center channel for a Triton based theater system, as well as a perfect choice to go alongside a wall- or shelf-mounted flat screen. Of course, the 2.5" depth makes it a perfect on-wall match for the new generation of super thin flat screens. Its cabinet is constructed from piano-gloss-black-finished aerospace-grade aluminum and contains two GoldenEar 4.5" cast basket bass/midrange drivers with Multi-Vaned Phase Plug (MVPP) configured in a D-Appolito array, surrounding the High-Velocity Folded Ribbon tweeter. Two 4"x 7" quadratic planar low-frequency radiators complete the driver complement. Wall mounting is easily accomplished using the threaded inserts or keyhole mounts on the rear, or table top using the optional smoked-glass Table/Shelf Stand 50 (shown, right), or even floor standing using the optional SuperStand 50 Floor Stand - note total height of speaker and floor stand is 48". The horizontal SuperSat 50C center-channel version includes adjustable leveling feet allowing for multiple angles when shelf/table top mounting. Like the signature Triton Two, the Seven combines a D-Appolito array of bass midrange drivers, which surround the same, now famous, High Velocity Folded Ribbon Driver, (HVFR) used in both the Triton Two and Three. The HVFR tweeter functions by pressurizing the air, rather than pushing and pulling it, for much better impedance matching with the air. This results in superb extension combined with a silky smooth non-fatiguing character, which is both unique and extraordinary. The spiderleg cast-basket 5.25" bass/midrange drivers, newly developed at our Arnprior, Canada engineering facility, have been specifically designed for exceptionally long-throw for tremendous dynamic range and extraordinarily deep bass response. The Golden Ear high-resolution sonic performance makes it perfect for the highest quality multi-channel music and home theater systems. 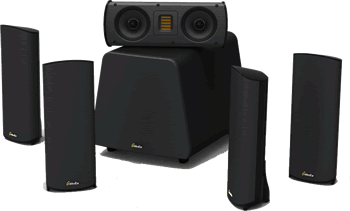 more powerful versions of our award-winning SuperSat 50 and 50C. They are designed to complement 60" and larger screens when used as left and right channels and mounted vertically next to them, as well as all screen sizes when used as a horizontal center channel or mounted on their optional stands. They provide a larger, more powerful, higher power-handling step-up from our SuperSat 50C when used as a center channel paired with any of our Triton Towers or with any of our other speakers including the SuperSat 50s. The sleek, attractively sculpted cabinet follows the same design philosophy that won the SuperSat 50 the highly respected Resi Award as the industry's best looking on-wall loudspeaker. It is constructed from aerospace-grade aluminum and finished in gorgeous piano-gloss black. It contains four GoldenEar engineered 4.5" cast spiderleg-basket bass/midrange drivers with Multi-Vaned Phase-Plugs (MVPP) configured in a two-stage D'Appolito Array surrounding our signature High-Velocity Folded Ribbon high-frequency radiator. Two 4" x 7" quadratic planar low frequency radiators complete the driver complement, perfectly loading the bass/midrange drivers for open, boxless midrange and extended low-frequency response. The SuperSat 60 and 60C's very thin depth makes them perfect for wall mounting next to the latest super thin TVs. This is easily accomplished using the threaded inserts or keyhole mounts on the rear. Dual adjustable feet allow multiple angles when shelf-mounting the horizontal center-channel 60C. In addition, optional floor and tabletop stands are available for vertical mounting. The SuperSat 3 is an elegantly curved, compact satellite speaker designed for use when very high-performance yet small size is desired. It is also the ideal matching rear or side surround speaker for a system based on the Triton Two or SuperSat 50. In addition, four SuperSat 3's and one SuperSat 3C, combined with a ForceField 3 powered subwoofer, make up the superlative SuperCinema 3 sub/sat multichannel system. The SuperSat 3 models incorporate two GoldenEar MVPP 4.5" cast-basket bass/midrange drivers positioned on either side of the HVFR tweeter. The SuperSat 3's svelte, 2.7" deep, 12" tall cabinet is constructed from a rigid, non-resonant marble-powder infused polymer and is finished in a gorgeous piano-gloss black. The SuperSat 3 includes a stand for shelf mounting; the SuperSat 3C includes an adjustable angling foot for ideal center channel positioning. The ForceField Subwoofers unique and attractive cabinet shape, with its non-parallel cabinet walls (the top is narrower than the bottom when viewed from the front), helps the ForceField subs achieve extraordinarily deep and tuneful bass that is ideal for music and movies. 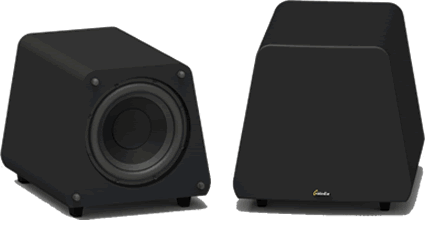 There are two ForceField powered subwoofer models. The compact ForceField 4 (upper-right) incorporates the same 1200-watt digital amp developed for the Triton Two. It drives a front-mounted high-power ultra-long-throw 10" sub-bass driver coupled to a downward-firing 11"x 13.9" quadratic planar infrasonic radiator. The ultra-compact ForceField 3 (upper-left) is basically a smaller, less-expensive version of the ForceField 4, with a 1000-watt digital amp, 8" active driver and 9.6"x 11.4" quadratic planar infrasonic radiator. The ForceField Subwoofers cutting-edge amplifier design employs state-of-the-art DSP control for frequency shaping so the subs produce accurate, consistent and musical bass performance. It also has a PLD (Programmable Logic Device) based state machine with an ultra-fast update time to manage a myriad of functions including soft-clipping, DC offset control, output-stage antisaturation protection and discrete multi-band limiting. Intrinsic circuit distortion is an order of magnitude less than on prior existing design technologies, allowing a reduction in the amount of negative feedback required to achieve low distortion and yielding excellent stability and transient response. Both are wireless-ready to accept an optional wireless kit.Finish on the subwoofers is matte black.